Bananas as we know them began to be developed in Africa about 650 AD. Bananas were discovered by the Portuguese on the Atlantic coast of Africa. They cultivated the fruit on the Canary Islands. From there it was introduced to the Americas in 16th century by Spanish missionaries. Today, there are over 1000 different varieties of bananas growing around the world. But 95% of banana exports come from a single cultivated variety, the Cavendish. The banana is an edible fruit which is botanically a berry. The banana plant is called a ‘banana tree’ in popular use, but it’s technically regarded as a herbaceous plant (or ‘herb’), not a tree, because the stem does not contain true woody tissue. Bananas are the most popular fruit in the world: in fact, over 100 billion bananas are eaten around the world every year, and around 51% of these are eaten at breakfast time. When a banana plant is mature, it stops producing new leaves and begins to form a flower spike or inflorescence. Each banana plant normally produces a single inflorescence, also known as the “banana heart”. The banana plant is the largest herbaceous flowering plant. Plants are normally tall and fairly sturdy, and are often mistaken for trees, but what appears to be a trunk is actually a “false stem” or pseudostem. Cultivated banana plants vary in height depending on the variety and growing conditions. Most are around 5 m (16 ft) tall, with a range from ‘Dwarf Cavendish’ plants at around 3 m (10 ft) to ‘Gros Michel’ at 7 m (23 ft) or more. Export bananas are picked green, and ripen in special rooms upon arrival in the destination country. These rooms are air-tight and filled with ethylene gas to induce ripening. The vivid yellow color consumers normally associate with supermarket bananas is, in fact, caused by the artificial ripening process. If bananas are too green, they can be put in a brown paper bag with an apple or tomato overnight to speed up the ripening process. There are 89 calories in 100 grams (3.5 ounces) of bananas. From here, traders and travelers took them to India, Africa and Polynesia. The banana fruits develop from the banana heart, in a large hanging cluster, made up of tiers, with up to 20 fruit to a tier. The hanging cluster is known as a bunch, comprising 3–20 tiers, or commercially as a “banana stem”, and can weigh 30–50 kilograms (66–110 lb). Individual banana fruits average 125 grams (0.276 lb). In 327 BC, when Alexander The Great and his army invaded India, he discovered banana crop in the Indian Valleys. After tasting this unusual fruit for the first time, he introduced this new discovery to the Western world. The banana fruits develop from the banana heart, in a large hanging cluster, made up of tiers, with up to 20 fruit to a tier. The hanging cluster is known as a bunch, comprising 3–20 tiers, or commercially as a “banana stem”, and can weigh 30–50 kilograms (66–110 lb). 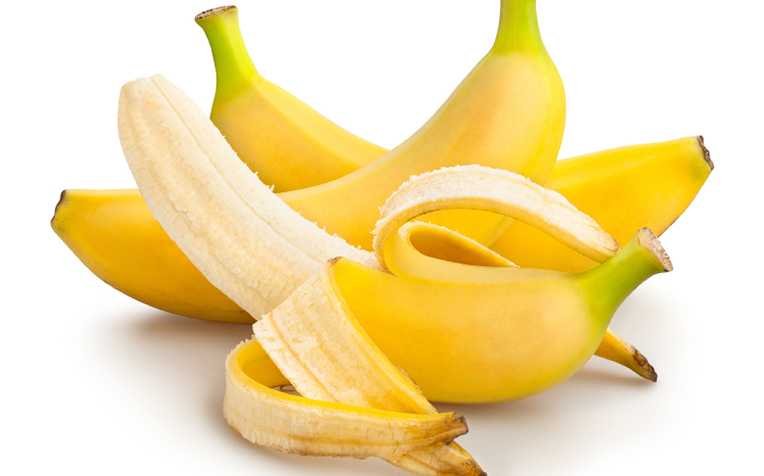 Individual banana fruits average 125 grams (0.276 lb). Wild bananas are completely full of seeds, and are only barely edible. Commercially grown bananas that are cultivated specifically for consumption do not have seeds. Commercial banana plants are reproduced by using banana pups. The mature banana plant forms rhizomes that grow into a little plants known as pups that can be removed and planted elsewhere. The word banana is thought to be of West African origin, possibly from the Wolof (language of Senegal, the Gambia and Mauritania) word banaana, and passed into English via Spanish or Portuguese. A banana contains a diverse range of nutrients, including dietary fiber, vitamin C, potassium, vitamin B6, key amino acids, iron, manganese, magnesium, folate, vitamin A, protein and a number of antioxidants, all of which make bananas one of the most nutrient dense and delicious foods you could add to your diet. The health benefits of banana include helping with weight loss, reducing obesity, curing intestinal disorders, relieving constipation, and curing conditions like dysentery, anemia, tuberculosis, arthritis, gout, kidney and urinary disorders. Banana can also help with menstrual problems and burns. It is good for reducing blood pressure, protecting heart health, boosting metabolism and immunity, reducing the severity of ulcers, ensuring healthy eyes, building strong bones, and detoxifying the body. Banana Leaves are spirally arranged and may grow 2.7 metres (8.9 ft) long and 60 cm (2.0 ft) wide.